Alix Home Solutions is a Cleveland General Contractor that specializes in interior home renovations and services the Greater Cleveland area as the #1 home renovations company. We are very proud of our reputation as reliable contractors in Northeast Ohio, which means we must adhere to the highest level of quality and service. Our company is fully licensed and insured. Alix Home Solutions is unique in the fact that we offer just about every service that you might require from every point of the construction process. Whether your project is for a bathroom, a kitchen, or for your entire home, we provide services for each step of the way. 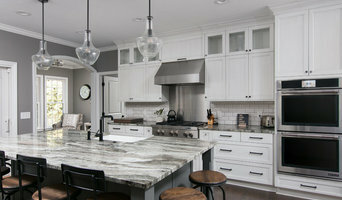 Please take a look at all of our services offered below, including an in-house kitchen and bath designer, project management, and an in-house granite shop, among many others. Our granite shop allows our clients to get every service needed through one contractor, making it easier for planing, budgeting, and allows the process to be as stress free as possible. We fabricate and install granite, quarts, marble, etc. slab as counter tops, benches, thresholds, shelves, among other things. Our many services allow our clients to experience a fluid, easily coordinated renovation process. Our goal is for you to get your dream home and to enjoy the process along the way. We are professionals with many years of experience and the perfect team to give you a dream renovation at an AFFORDABLE prices. We stand by our work 100%. Request a free estimate today and pretty soon, you just might have the house of your dreams! The team of experts and professionals at Green Impressions works closely with you to create an elegant and inviting landscape you’ll love. 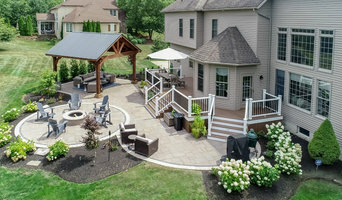 We design and build residential outdoor living spaces for homeowners across Northeast Ohio. Our process begins with a free consultation to discuss your needs and goals. We then use specialized design solutions and services to match this creative vision. As a full-service landscape design firm, we also offer maintenance services for both residential and commercial grounds. We have a range of packages available, so you can customize your selection to best meet the maintenance needs of your property. With every project, we aim to provide clients with outstanding service from beginning to end. Our goal is to not only help landscapes thrive, but to build relationships that thrive as well. Dyson Construction LLC is a family owned business serving Northeast Ohio for over 50 years. We specialize in Custom home builds, additions, finished basements, kitchens, luxury baths, decks or any remodeling project you can think of. We can take your project from the design phase to completion. We are a premier, award-winning, design/build company established in 1974 by Jeffery L. Barker. We provide the highest standards in horticultural installation, creative custom design, craftsmanship and functional construction for residential and commercial customers. Our team of dedicated, experienced, personnel are committed to providing unparalleled service to the discriminating client. Lets make your landscape great again! We are a well established landscape contractor with over 27 years of solid experience. Landscape Solutions Unlimited has completed projects throughout the Ohio region as well as many others in various locations. We specialize in designing and installing customized projects that not only beautify the home or business, but also meet our clients expectations. We utilize the very best design technology to provide our clients with realistic depictions of what the project will actually look like before it is installed. We look forward to meeting you and taking your landscape to another level! If you are looking for the most cheerful and elegant holiday lighting, we have over 16 years of expertise to make your holidays very unique and memorable! Hansen Restoration, Inc. is a full-service contracting company that specializes in high-quality restoration and construction projects. As a family-owned and operated business located in Northeast, Ohio, we offer over 70 years of combined experience in the field. Whether life has thrown an unexpected event your way, or you are looking to conquer a new project in your home, Hansen Restoration is here to help every step of the way! There is no project too large for us to handle. At Hansen Restoration, we believe that every start deserves a great finish! A Perfect Coverage is a design build company dedicated to providing the right solutions for any client for every project. From everyday household fix-ups to large scale construction jobs we’ve got the tools, the people, the experience and the ability to get the right job done the right way. If it’s broke I’ll fix it. This is including, but not limited kitchen, bathrooms, finish basements, to construction, painting (interior & exterior), landscaping, electrical, plumbing, drywall, roofing, concrete, retaining walls, fencing, lawn sprinklers, outdoor lighting, patios, walkways, waterfalls, ponds & drainage. It’s just one call and we’ll do it all … – Tim Ford / Owner If you want things done right please call us. We’ll let you know what it takes to do the job so that it looks great but also lasts forever. Sometimes this means that we’re not always the cheapest, but our credibility is more important to us than saving a few bucks by taking short-cuts. Our long list of projects and customer testimonials speaks for itself.